The passenger compartment remained stable in the frontal impact. Structures in the dashboard presented a risk of injury to the knees and femurs of both the driver and passenger dummies and the car was penalised. The Compass was tested with an optional side thorax airbag. In the side pole impact, dummy readings of rib deflections indicated a high risk of serious chest injury, even with the airbag fitted, and the car scored no points in that test. In the side barrier test, the car scored maximum points. Euro NCAP has reviewed data supplied by Jeep and concludes that scoring in the side barrier test is not significantly affected by the airbag. The Compass is equipped with an active head restraint. This senses when the car has been struck and deploys the restraint to reduce the distance between the head and the restraint. However, Jeep did not provide evidence to demonstrate that the system operates robustly over a range of speeds and impact severities specified by Euro NCAP, so the system was tested 'passively', without deployment. Test results indicated marginal protection against whiplash injuries in a rear impact. Tested restraint (Fit): Fair G 0/1 ISOFIX CRS type 'S', Type 'F' Base. Tested restraint (Fit): Fair G 0/1 ISOFIX CRS type 'S', Type 'B' Base. Forward movement of the head of the 3 year dummy, sat in a forward facing restraint, was not excessive in the frontal impact. In the side impact, both the 3 year and the 18 month dummies were properly contained within the protective shells of their restraints, minimising the risk of contact with parts of the car's interior. The passenger airbag cannot be disabled. The risks of using a rearward facing restraint in that seating position without first disabling the airbag were explained in an English-only label on only one side of the passenger sun visor. The bumper scored no points for its protection of pedestrians' legs. The front edge of the bonnet also scored no points, offering poor protection in all areas tested. The bonnet provided good protection in some areas where a child's head might strike, but was poor or marginal in others. In those areas where an adult's head would strike, the bonnet was almost entirely poor. The rating of the Compass is limited to two stars by its performance in pedestrian protection. Electronic Stability Control is standard equipment. A seatbelt reminder is standard equipment for the driver and front passenger seats but did not meet Euro NCAP's requirements, and was not rewarded. 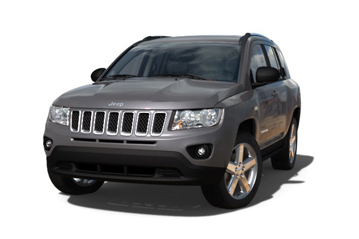 A speed limitation device is not offered on the Jeep Compass.